MacFlatplan is an application, which you can use to make a map of your publication and see where all the articles and adverts are laid out and in what order. – You can do as many Macflatplan document as you will. – Unlimited number of pages per publication. 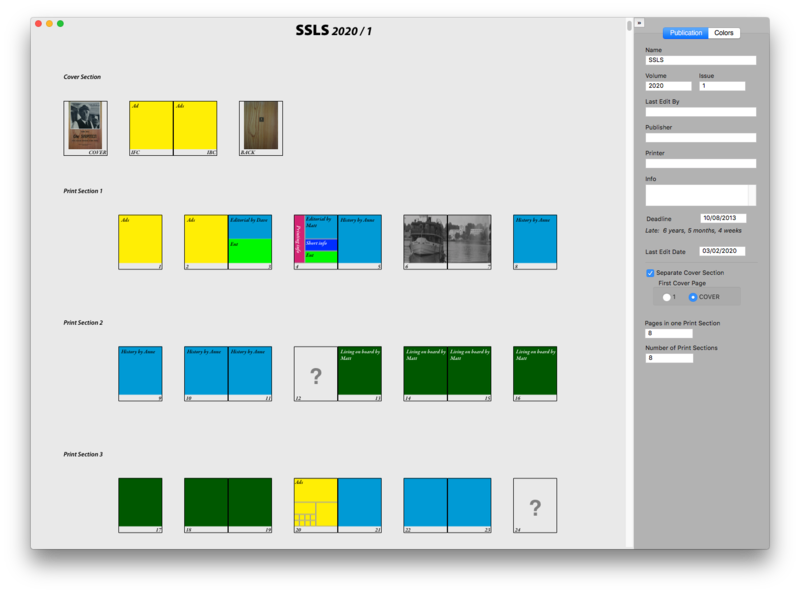 – You can import the colors and the publication information from another Macflatplan document. – It's easy to drag pages to a new place. – You can handle the publication as the print sections or as one whole. – The Flatplan window chooses width which is suitable on your window, but you can change the width suitable for your printing paper. – You can copy and paste the page contents. – You can import pictures on the pages (pdf, tiff, png, jpg). – You can make your own custom page library use all of your publication planning. – Only one registration fee, no other fees. – Fixed a problem which caused the vertical text in the prints aligned incorrectly. – The updating system has replaced to a new one. – When using Print Sections and Separate Cover Section, it is possible to start the Print Section page numbering from 1 or 3. – Corrected the problem where the vertical text was too up in the prints and PDFs. – Selecting the fonts has been improved. – MacFlatplan is now a 64-bit application. – Some improvements have made for the contextual menu of the Flatplan window. – Some improvements have made for El Capitan. – You edit the page contents on the Flatplan window by the contextual menu instead of the separate palette. – You can import pictures on the pages (pdf, tiff, png, jpg) instead of using text representation. You can drag and drop the picture on the page on the Flatplan window or open it by contextual menu command. – If you don't use Print Section, you can use any number of pages. The number in the page field is red if the page number is not equal with the print sheets. – The spreads will no longer be split in two rows in any case. – The colors and texts can be edited on the Flatplan window by using the contextual menu (colors) or double clicking the page icon (text). – The last edited document can be set to open automatically on the launch. – The available grid is 8*8 squares to make layout which meet your need. – You can rotate the text vertical. – You can use Color library of the current Flatplan document when you are making custom pages, but you can use your custom pages in every publication. – You can edit texts and colors on your Flatplan document window, but these changes will not have an effect on your custom page library. But you can copy the page from Flatplan document window and paste it onto the Custom Page Window to make a new custom page that way. – You make the custom page by dragging from the top left corner to the bottom right corner of the area of the page for every area. – Use the contextual menu to color the area, to bring the text edit field on it or to change the text to vertical or back to horizontal. – Put the name of your new custom page in the name field and click the plus button to add it on the list. – If you want to change something on some custom page of your library, select it on the Custom Page window and make the changes. When you are finished, click the update button (which has the check mark symbol) to save the changes. – The custom page list appears in the contextual menu Page Arrangement. How to create a new document. How to make Custom Pages. How to edit the page contents. How to move the pages. How to print the project.